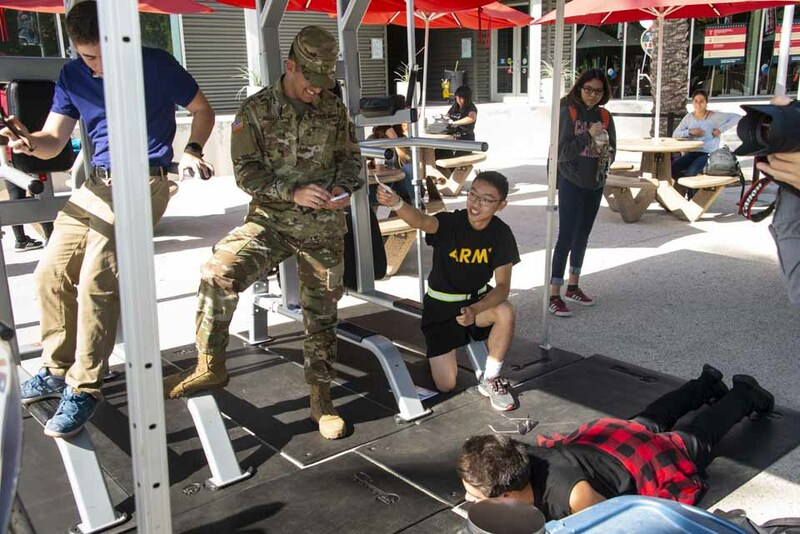 A CSUN student tries to hang with an ROTC student in a squat exercise. Photo by David J. Hawkins. 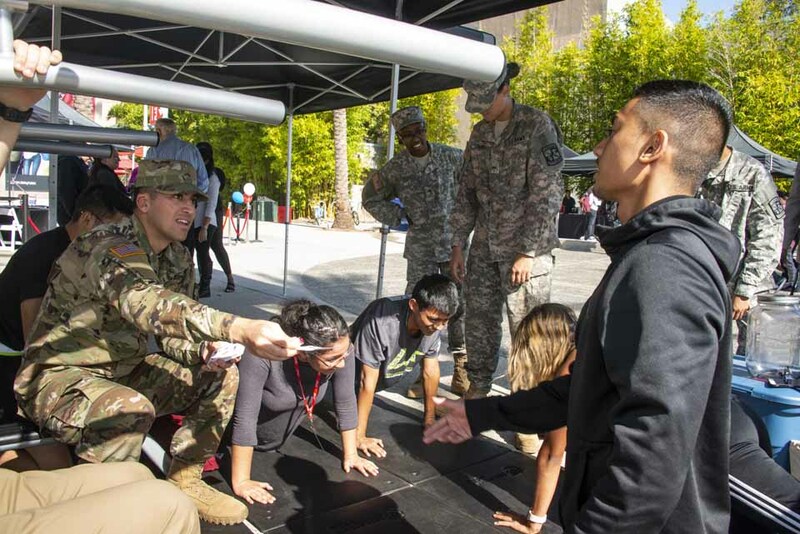 Students participate in a push-up challenge at the We ❤ Our Veterans Week: Party on the Plaza. Photo by David J. Hawkins. A student checks out the information booth at the We ❤ Our Veterans Week: Party on the Plaza. Photo by David J. Hawkins. A group of ROTC students pose for a picture at the Students and Veterans party. Photo by David J. Hawkins. Busy tents, men and women in military uniform, and patriotic balloons painting the scene red, white and blue—that is what awaited students of California State University, Northridge as they stepped into the Plaza del Sol, located in the center of the University Student Union (USU), on Thursday, Nov. 8. 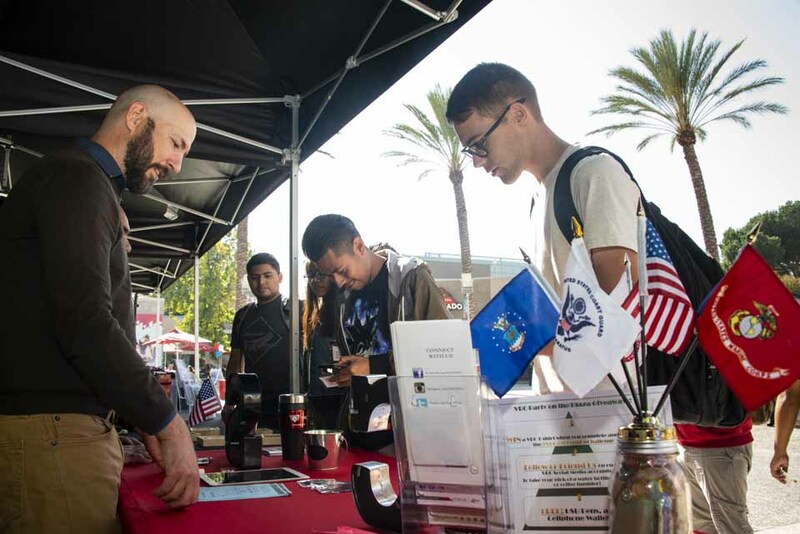 The We ❤ Our Veterans Week: Party on the Plaza event was one of several events during the Veterans Resource Center’s (VRC) We ❤ Our Veterans Week celebration, the CSUN Students and Veterans Party served as a festive way to honor and learn more about the university’s student veterans. Anyone who wanted to be a part of this block party received a stamp card indicating a variety of activities found under different stations around Plaza del Sol. 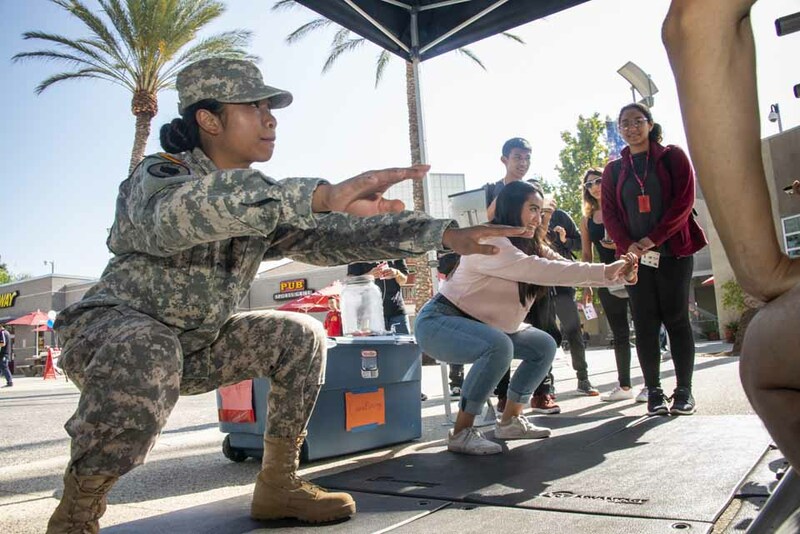 These activities included writing a letter of appreciation to the veterans conducted with the help of CSUN’s Unified We Serve, visiting a Humvee parked behind the Northridge Center, taking pictures at the photo booth and taking on the 20 push-ups challenge. For each activity completed, participants would get a stamp on their card. Get three stamps, and enjoy a free meal from In-N-Out, serving fresh burgers right from their In-N-Out Cookout Truck. Scores of giveaways were available at the information booth. The 20 Push-Up Challenge is designed to bring education and awareness to the average of 20 veterans that commit suicide every day; participants are asked to show their acknowledgement & support of veteran mental health care. Those who successfully completed the 20 push-ups challenge won a VRC T-shirt, and those who followed the VRC on Instagram were gifted with a wooden labyrinth puzzle game. As students received swag including water bottles, phone-case wallets, ball pens and We ❤ Our Veterans pins, they could also obtain more information about veterans, volunteering at the VRC, and the Reserve Officers’ Training Corps program. Nick Cruz, a VRC administrative assistant who was at the information booth, said that the men and women in uniform roaming around and helping out the different booths were CSUN students currently undergoing the ROTC program, which is a scholarship program that would aid those students with tuition and other fees as they train to become commissioned Army officers. Indeed awareness was the heart of the We ❤ Our Veterans Week event, of which the CSUN Students & Veterans Party was a part of. Previous Veterans Week activities also comprised of the Veterans Appreciation Game between CSUN Men’s Basketball and Cal State LA; a Sigma Tau Alpha-hosted 5K Fun Run; Veteran Ally Training for CSUN faculty, staff and student leaders conducted in conjunction with the federal Joining Forces program; and the Associated Students Farmer’s Market: Student Veteran Recognition. On Veterans Day itself, Nov. 11, The San Fernando Valley Veterans Day Parade took place in Mission Hills; the VRC, CSUN’s Student Veteran Organization and Veteran Alumni Chapter all participated. “We Love Our Veterans Week is all about education, awareness, as well as celebration,” said Amber Bartmus, supervisor of the VRC. A collaboration of a vast network of veteran supporters is what made the event possible, said Bartmus. 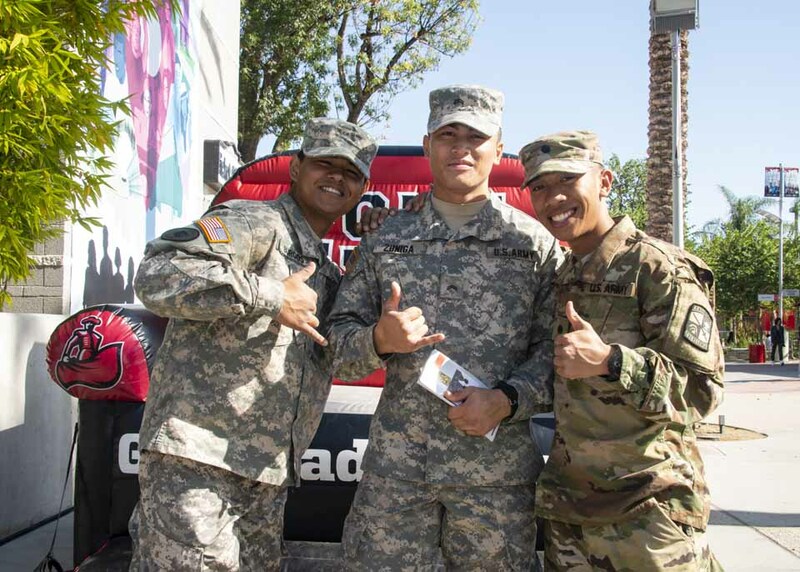 This network includes different organizations, including CSUN athletics (who provided the inflatable chair at the photo booth), CSUN’s volunteer program Unified We Serve (who spearheaded the station for the letters of appreciation), as well as VRC employees—one of whom even made the connections to bring the Humvee on campus. “It’s really a sort of past, present and future event,” said Bartmus. 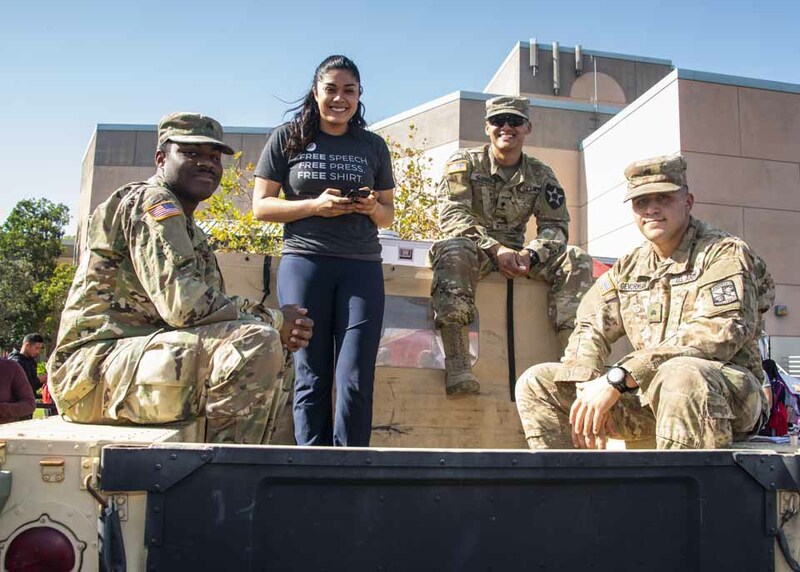 By participating, the CSUN community honors what the veterans have done for the nation in the past, celebrates the results of those efforts in the present and looks ahead to the future as it is made more aware of its student veterans, she said.